We’ve said before that one of the benefits of advertising in Homes & Land magazine is its shelf-life – something that websites and newspapers just can’t duplicate. Last week we received incredible proof of the shelf-life of Homes & Land. Homes & Land has a request line, where home buyers can call a toll free number or go online and order a magazine from across the US and Canada. Before the Internet, we also included request cards inside the magazines themselves. Last week we received one of these cards. 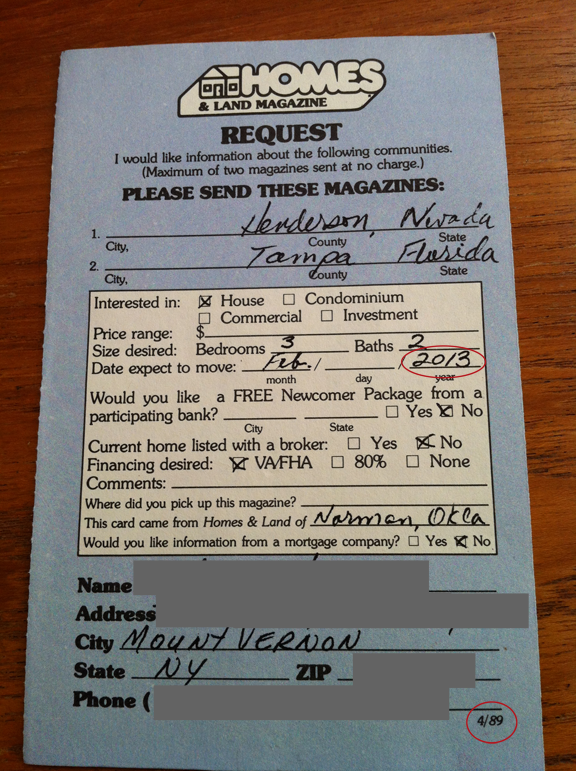 Our reader in Mount Vernon, NY kept her Homes & Land magazine for 22 years. Talk about shelf-life!